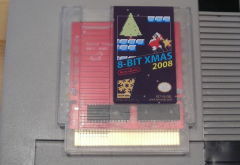 Don't just send a card, send a personalized 8 BIT XMAS 2008 cart! 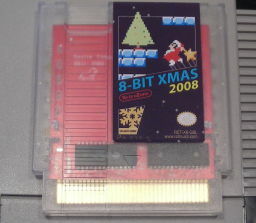 This first ever NES Christmas cart is a great gift and background for your parties. Enjoy a peaceful snow scene (based on the snow demo by Anders Astrand) instead of the typical fireplace channel on your TV. Then use the controller to change between 4 different holiday tunes with authentic 8 bit sound. While everyone is drunk on egg nog use the controller to switch between many different patterns for the colorful blinky lights that surround the edge of the cart! Top loader recommended to see the pretty colors, but front loader looks cool too. For the personalized touch, you get to choose the on screen message and the message inside the printed card. Send one to each of your friends, or just a few to yourself! Payment and personalized message must be received on or before Dec 15th to ship before Christmas. Delivery by Christmas is not guaranteed. Orders will end on Dec 31. Orders will only ship to the shipping address provided with the order, no changes once the order is submitted. See the FAQ for contact info to send your personalized message. On screen message is 4 rows by 32 characters, only capital letters, no punctuation. Printed message can be longer and can include any characters. Whole package Snow and music Blinky lights!